Pretty fancy, no? From concept to table, this dessert was made by Little Six. I still have no idea what inspired him, but for a couple of weeks he couldn’t stop talking about a mysterious dessert called a “tarty.” He proposed a few variations (some of which involved several layers of chocolate cake topped with pudding, frosting, fruit and sprinkles), but he seemed very happy with the streamlined version we settled on. We, the taste testers, were happy, too. As promised, here is the recipe. For the crust: Put 20 chocolate sandwich cookies (Oreos) and 1/4 cup melted butter in the food processor. Process on high until finely ground. Divide the crumbs evenly among the tart pans and press evenly around the base and sides. Refrigerate for at least 30 minutes. For the filling: Follow this recipe for Pastry Cream (don’t leave out the whipped cream at the end). When thoroughly chilled, fill each tart crust with pastry cream and smooth with a small spatula. 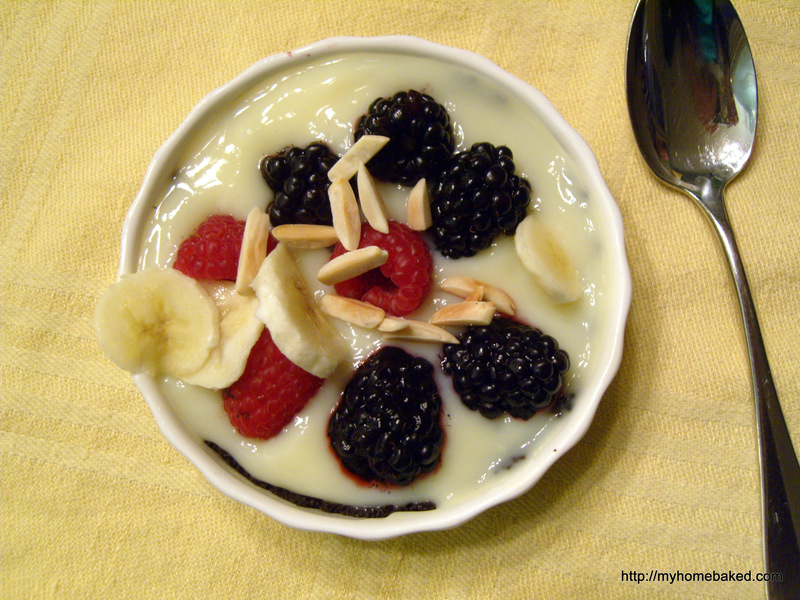 Just before serving, top each tart with fresh berries, sliced bananas, and toasted almonds.